Sometimes our clients cannot settle without one type of the map. For instance, we have the US map for WordPress and Canada map for WordPress. Surely, there is a combo map – US+Canada, but what if the company works across both countries yet doesn't cover them in entirety? This is exactly the case of IPEX. The company covers the entire US as well as the Eastern part of Canada. Two individual maps are not a very convenient solution, neither for the company, nor for its clients. So they asked for customization. The requirements of the client were simple: make a combined US+Eastern Canada map for easier search for the nearest rep, tailor colors of the map to the corporate style, and add buttons with full names of provinces along with minor changes in their positioning. We started from making a custom SVG file containing a combination of US states and Eastern provinces of Canada. This step required the major portion of work. Then we adjusted positioning, colors and other minor settings to make the map fit IPEX's corporate style. Finally, we compiled the JS map of US and Eastern Canada. It looks as shown above. However, the customer's website is based on WordPress, so we also wrapped the map into a one-click-setup WordPress plugin to make deployment of the map easier. Custom HTML5 maps are a good way to display your international geography, even if it doesn't fit standard schemes or conventional borders. 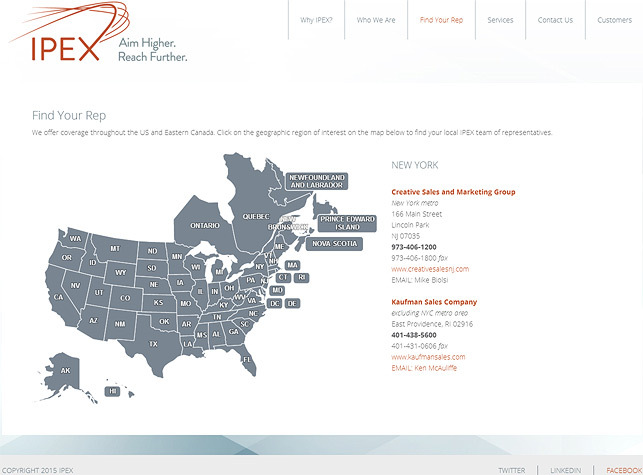 Extending the map by a few regions, or shrinking it down to only those states you operate in – custom development of an HTML5 map at Fla-shop.com can solve both tasks for a reasonable price.